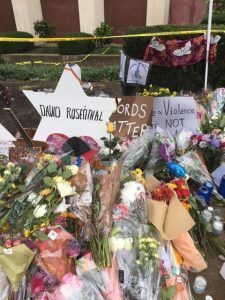 Soon after we learned of the terrible massacre of eleven Jews over a week ago on Shabbat Parashat Vayera, October 27, 2018, I was requested by Allen Fagin, the Executive Vice President and Chief Professional Officer of the Orthodox Union, to represent the OU in Pittsburgh, the city where this tragedy occurred. I was asked to spend Thursday, November 1, in Pittsburgh attending funerals, visiting the bereaved, interviewing members of the community there, and, if possible, visiting the wounded and the first responders. I was able to coordinate my visit with similar visits by two of my respected colleagues, Rabbi Mark Dratch, Executive Vice President of the Rabbinical Council of America, and Rabbi Daniel Korobkin, spiritual leader of the BAYT Congregation in Toronto, Ontario. A congregant of Rabbi Korobkin’s synagogue is the brother of one of the victims. I was able to catch a flight to Pittsburgh, arriving there early Thursday morning. Rather than simply describing my visit to Pittsburgh in a step by step manner, I will attempt to place my entire experience into an emotional and spiritual context. I also felt a great pain and grief, which was exacerbated the instant I entered the Ralph Schugar Chapel in downtown Pittsburgh. There, I joined the funeral of Sylvan Simon and Bernice R. Simon, a husband and wife, both well into their eighties. The sight of twin coffins, standing side-by-side, one draped with an American flag, was almost too much to bear. That two individuals attending Shabbat services in a synagogue should suffer such a tragic fate was shocking and brought me to tears. I joined the entourage of visitors all lined up single-file to offer expressions of condolences to the children, grandchildren, and extended family of Mr. and Mrs. Simon. The person immediately ahead of me on line represented the Israeli Consulate and expressed the sympathies of the entire State of Israel. I was able to say that I represented the Orthodox Union and its hundreds of member synagogues. Each and every one of the bereaved tearfully expressed their gratitude for my visit, and some said that they felt especially uplifted that the Orthodox Jewish community was with them at this sorrowful moment. From the funeral chapel, my rabbinic colleagues and I proceeded to the Tree of Life synagogue. We were not permitted to enter and subsequently learned in detail about the unspeakably terrible condition of the sanctuary and other rooms in which the victims met their fate. An individual who worked along with the volunteers of Misaskim and Chesed Shel Emes, two New York-based chevra kadisha groups who rush to the scenes of such tragedies to guarantee the proper halachic attendance to the bodies of victims, briefed us in graphic detail about the condition of the bodies and the condition of the entire venue, even after several days of restoring the synagogue to its prior state in a respectful manner. Outside the synagogue was a huge collection of spontaneously arranged expressions of grief by the broader community, Jews and non-Jews alike. Heaps of flowers and posters declaring sympathy, compassion, and love were everywhere to be seen. We then spent some time in a room in the apartment building where Joyce Fienberg, one of the victims, lived. A large room in the building was designated as a place of mourning and prayer for her immediate family. We expressed our condolences to all the mourners, which included the many friends and professional colleagues of Mrs. Fienberg. We connected with her brother, the congregant of Rabbi Korobkin’s synagogue, who led all assembled in the Mincha prayers. We also connected with Mrs. Fienberg’s son, who resides in Paris, France. The Rabbi of the Grande Synagogue de la Victoire in Paris, Rabbi Moshe Sebbag, was present, along with others of the Paris Jewish community. Rabbi Sebbag invited me to say a few words at this occasion. I was unprepared to deliver formal remarks, but as usual, a most appropriate message came to mind, inspired by special siyata dishmaya. I spoke of the similarities between a Torah scroll and a good person. A Torah scroll begins with an empty piece of parchment, which is merely an animal skin without any intrinsic sanctity. However, once the sofer inscribes the parchment with words of the Torah, it begins to attain sanctity. Similarly, all human beings are essentially “parchment,” mere animal skin. But as we begin to live our lives and perform good deeds, our “animal skin” begins to gain sanctity. Mrs. Fienberg, I continued, and with the other ten victims performed many good deeds in their lifetimes, thus accumulating great sanctity, and it is for these sacred souls that we mourn at this moment. Those in attendance, many of whom were relatively ignorant of such Jewish sentiments, approached me and were so touched by my words that they asked me to personally bless them. I composed a brief “original” prayer, appropriate to the occasion, which stood me in good stead later in the day as numerous people approached me with a request, “Rabbi, I don’t know why, but I must ask you to please bless me”. 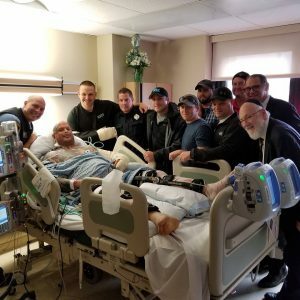 The most unique experience of the day was at a visit to the wounded police officers at the UPMC Presbyterian Hospital. It was there that we were joined by Judge Daniel and Mrs. Nina Butler, friends of mine from long ago who are leaders in their Pittsburgh Jewish community, and who have been associated with the Orthodox Union in many capacities. Through his distinguished judicial position, Judge Butler was able to help us gain access to the hospital bed of one of the seriously wounded policemen, Mr. Timothy Matsen. In the room with him was another wounded policeman and about a dozen other heroic first responders. I expressed my gratitude to the entire group, and Rabbi Dratch and I were able to convey the profound admiration that the entire American Orthodox Jewish community, indeed the entire Jewish people, have for these unbelievably courageous individuals. The “blessing” that I had composed earlier that day was very useful in that context, as several of those present requested my blessing. Fortunately for me, I was able to join Rabbi Dratch, who had a rental car with him, on the trip back to Baltimore, where we both had arranged to spend Shabbat. It was initially during that four-hour journey, and even more in the subsequent several days, that I began to appreciate the rays of hope that pierced the otherwise dark clouds of fear and grief that dominated that day in Pittsburgh. Those rays began when I boarded the flight to Pittsburgh early that morning. 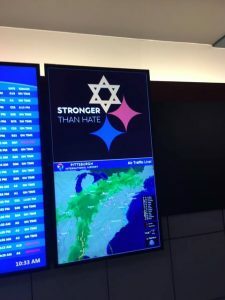 The stewardesses and ten or twelve fellow passengers, realizing that I was a Jewish clergyman heading toward Pittsburgh, approached me with expressions of condolence and solidarity. As I exited the plane, the pilot and copilot came out to similarly greet me. When I came off the plane and proceeded to the crowded Pittsburgh airport, I was approached by very many and very diverse individuals who expressed their sympathies to me. Most astounding were the signs all around the airport with red and blue diamond shaped stars underneath a white star of David, with the motto “stronger than hate” emblazoned above the stars. That sign, which I later encountered in many other venues throughout the day, is but one very bright ray of light. The many other rays of light included the attendance of numerous delegations of Jews from all over the country, and from Paris, who made it their business to come to Pittsburgh in person to express their solidarity and to re-echo the message that “we are all one!” These delegations included Charedim of the two chevrei kadisha, Yeshiva University, schools in Brooklyn such as the Yeshiva of Flatbush and Magen David, representatives of the Jewish Syrian community in Brooklyn and Deal, New Jersey, and many others. But perhaps the greatest ray of light was apparent during our visit with the unbelievably courageous first responders. As I think back to the numerous historical precedents of this horrific massacre, I recall all too well that no non-Jewish police personnel came to the aid of the victims of the all-too-numerous pogroms. The British police who were responsible for supervising the peace in 1929 Palestine absented themselves from the scene of the Hebron massacre. And the police in Germany actively participated in the disgraceful acts of Kristallnacht in 1938. The police of Pittsburgh, Pennsylvania, however, rushed to the aid of the congregants of a Jewish synagogue. They did so at the risk of their own lives, and some will literally bear the scars of their heroism for the rest of their lives. I am not naïve. I do not believe that the threats of anti-Semitism, and other anti-Semitic violence, can be ignored. But I can pray that perhaps, just perhaps, the Jewish people have turned a corner in our history. Perhaps we are beginning to see a glimmer of the changes in the relationship between the Jews and the nations of the world which is predicted by our holy prophets. Perhaps we are indeed approaching the Messianic moment when all mankind will enter that house of prayer which the Almighty Himself promises will be a house of prayer for all nations of the world. I returned from Pittsburgh with some residual fears and with the aftereffects of a day of nichum aveilim. But I also came away burning with a sense of hope and fervently pray that this sense of hope will not be extinguished.